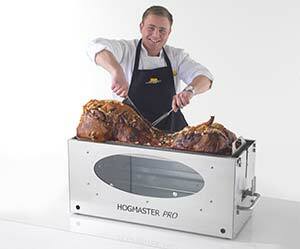 Our hog master machine has been on the market for a few years now and are still selling strongly against the rest of the range of hog roast machines. 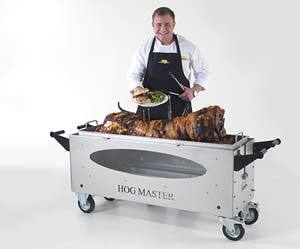 With another good year coming to a close soon we have seen more and more people going for the hog master machine. Although the Hogmaster machine is cheaper than the other machines in the range this doesn’t mean that it doesn’t produce the same quality freshly cooked meats. With is sleek and slim design the Hogmaster machine can fit through anything, also with its flat top design when you come to loading your van up once the machine has been loaded in, the top lid can be used to store other catering equipment on. This gives you more space to work with while trying to cram in all your gear in. The Hogmaster machine also has only the one burner, this makes the Hogmaster machine alot more economical when using but also the pig will cook in the same time as the other hog roast machines on the market, this again shows that this machine is perfect for any hog roaster just starting up or even just a machine that they would hire out because of the machines simplicity. So don’t hesitate call us today and order your brand new Hogmaster machine straight from the factory ready to receive the next day, or even come see us at our factory to meet the team and get to see first hand the quality of our machine. Rent A Hog Roast Machine!